There's never a better time to organize your studio than the week after New Year's Day. The gifts have been opened, vacations have ended and resolutions have been set. Your creative space has either recently been neglected in favor of holiday revelry or filled to the brim with new materials collected over days of Secret Santas and bargain shopping. Any way you spin it, the beginning of January -- ushering in a new month and a new year -- is just begging you to dive into the corners of your painting or photography studio and make room for inspiration. 1. Organize your paint with cake tins and stands. Just replace cupcakes with paint bottles. Glue cake tins to the stand if you want to prevent toppling. 2. Or magnetize your paint containers to store them upside down. 3. Fashion your own sewing thread shelf. Bonus: use nails to keep your bobbins in sight. 4. Use a wine rack and glasses to store your pens and pencils. 5. Keep your paintbrushes straight by stashing them in a planter. 6. Convert a hanging shoe organizer into a space for storing loose canvases and paper. Just cut out the bottoms of a few segments to make room for the length of your materials. 7. Reuse baby food jars for keeping beads, jewels or even pigments in order. Wash out, stack and voila. 8. Use a vintage train case for organizing collage materials -- buttons, paper scraps, knick knacks. 9. 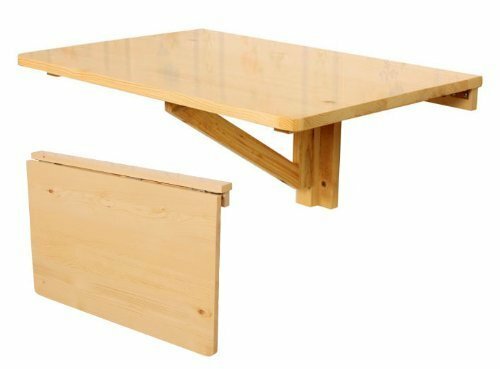 Turn a drop-down table into a DIY cutting table. Just add a cutting mat to the top. 10. 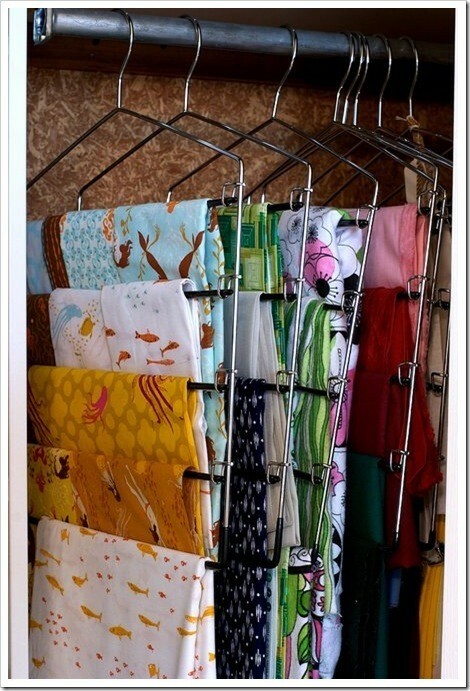 Drape your miscellaneous fabric in an empty closet with hangers. 11. 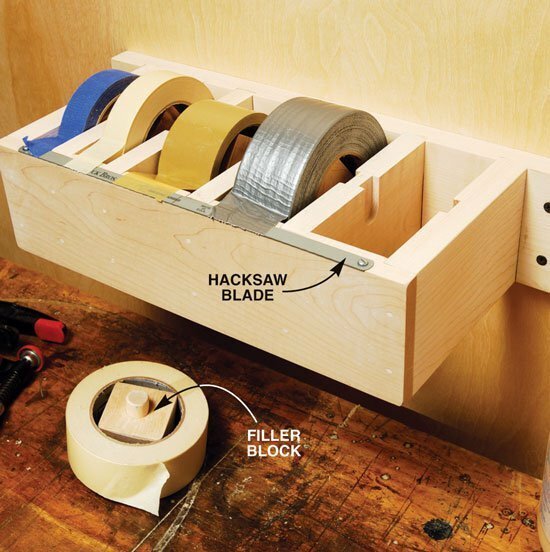 Make a multi-roll tape dispenser. 12. Keep your inspirations straight with magnets and vintage serving trays. Mount the metal trays on the wall and use magnets to post your photographs, to-do lists, sketches and other bits of inspiration. 13. Organize your sketches with an old lampshade. Just add paperclips and dangle. 14. Turn a mug tree into a scissor tree. Replace mugs with scissors. 15. Buy used card catalog cabinets or hardware storage cabinets and organize away. This is a genius piece of furniture for any studio. 16. Chalkboard paint, chalkboard paint, chalkboard paint. 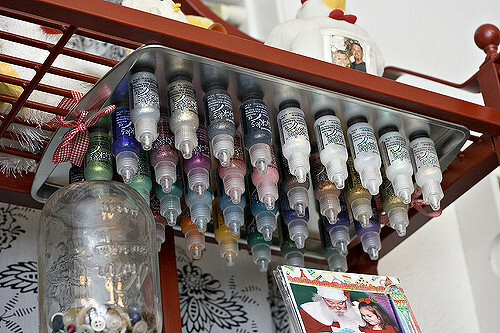 Paint it on jars, on cabinet drawers, on the wall -- it's great for taking notes, posting reminders or labeling materials. 20. 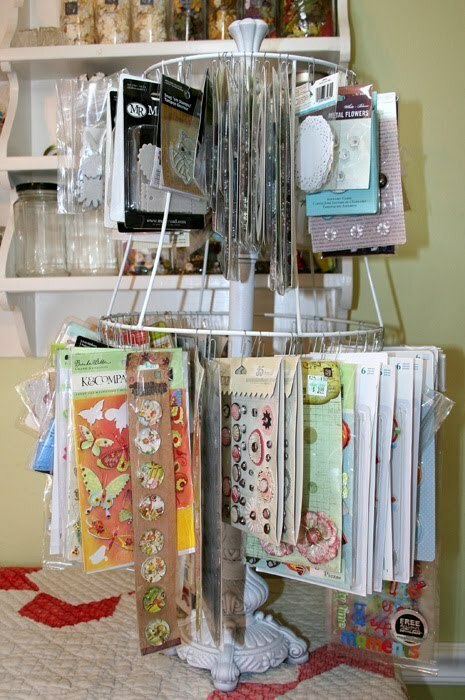 Turn paper clips and clothespins into hanging devices. You can hang pieces in process on the walls, which is good for decoration and preserving ongoing work. 21. Keep your camera lenses, cords and SD cards in the same place. And coordinate them. Lenses on one side and matching equipment on the other. Paint an object from your home or office.